With a distinctive Kangaroos graphic front and centre and woven locker tag with sponsor and team logos, you’ll find a reason to wear our Mens Supporters tee on all sorts of occasions, whether you’re cheering on the green and gold or chilling with your mates. Guys, if you’re a Kangaroos fan, this tee deserves pride of place in your wardrobe. 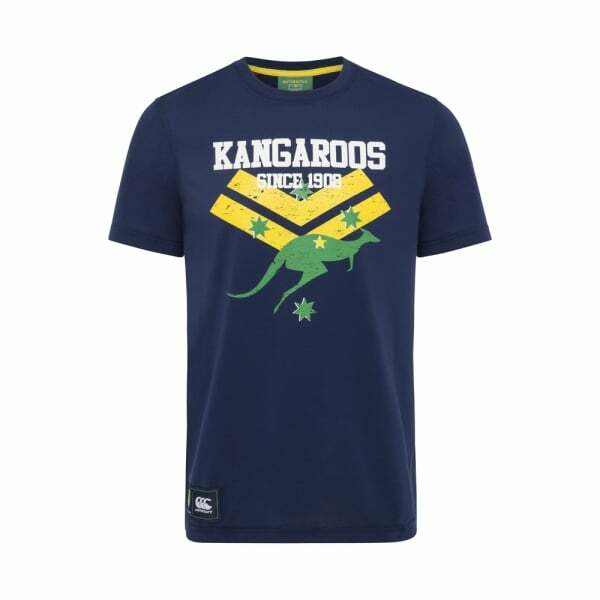 A crew neck tee made from a soft Polyester/Cotton blend, it has a striking Kangaroos graphic on the front celebrating the heritage of the mighty Kangaroos and a woven locker tag with sponsor and team logos, which shows everyone you’re a die-hard green and gold supporter. Whether you’re training, watching the game on tv or relaxing with friends and family, this tee can be worn on any occasion and the iconic CCC logo signals your membership of the Canterbury community of players, supporters and fitness enthusiasts.